Origin and Habitat: Aloe pirottae is very widespread in Ethiopia (Gamo Gofa, Sidamo, Bale, and Harerge regions) and is now also known to occur in northeast Kenya. Altitude range: This species is recorded from 900 up to 1,820 metres above sea level. Habitat and Ecology: Aloe pirottae grows in open acacia woodland, sometimes on dark soil is widespread and so presumably fairly common. Accompanying cactus and succulent species can be Euphorbia valida and Cotyledon papillaris. The species is likely to be locally affected by agricultural expansion and the resulting habitat loss and degradation. Description: Aloe pirottae is a stemless or very short stemmed maculate aloe. Aggressively suckering it forms small groups with shiny, brittle, long, narrowish leaves of pale green and very heavily spotted. The leaves form a rosette. The many branched inflorescences are covered with upright, bright yellow flowers near the end of branches. It is a very attractive species, but rare in cultivation. The first description by Alwin Berger was published in 1905. Derivation of specific name: The specific epithet honors the Italian botanist Pietro pirottae Romualdo Pirotta (1853-1936). Leaves: Blade dark green with many white elongated dots and dashes, 45 to 90 cm long and 6.5-13 cm wide. The leaf surface is smooth. Teeth on the leaf margin brown tipped, 4-5.5 mm long, 10 -15 mm apart. Inflorescences and flowers: The inflorescence has up to 28 branches and reaches a length of 100 cm and more. The loose, cylindrical racemes are 7-33 cm long. The egg-shaped, pointed or tapered bracts are 3-10 mm long, and 2-5 mm wide. The pedicles are 3-9 mm long. Flowers are cylindrical to almost club-shaped, yellow-green, or occasionally orange or red, 20-28 mm long, 6-8 mm in diameter at the level of the ovary. Outer tepals are fused together for 6-15 millimeters. The stamens and style barely protruding. Blooming season: The main flowering period (in habitat) is from November to January. Chromosome number: 2n = 14. 1) Weber, O. 2013. Aloe pirottae. The IUCN Red List of Threatened Species. Version 2015.2. <www.iucnredlist.org>. Downloaded on 03 August 2015. 2) Susan Carter, John J. Lavranos, Leonard E. Newton, Colin C. Walker “Aloes. The definitive guide.” Kew Publishing, Royal Botanic Gardens, Kew 2011, ISBN 978-1-84246-439-7, S. 384. 4) Gideon F. Smith, Colin C. Walker, Estrela Figueiredo “What’s in a name: epithets in Aloe L. (Asphodelaceae) and what to call the next new species.” In: Bradleya. Band 28, 2010, S. 98. 5) Alwin Berger: “Über die systematische Gliederung der Gattung Aloe” In: Botanische Jahrbücher für Systematik, Pflanzengeschichte und Pflanzengeographie. Band 36, Nummer 1, 1905, S. 65 (online). 7) BRANDHAM, P. E. & M. A. T. Johnson. 1982. “Polyploidy and chromosome interchange in Aloe (Liliaceae) from Somalia.” Kew Bull. 37: 389–395. 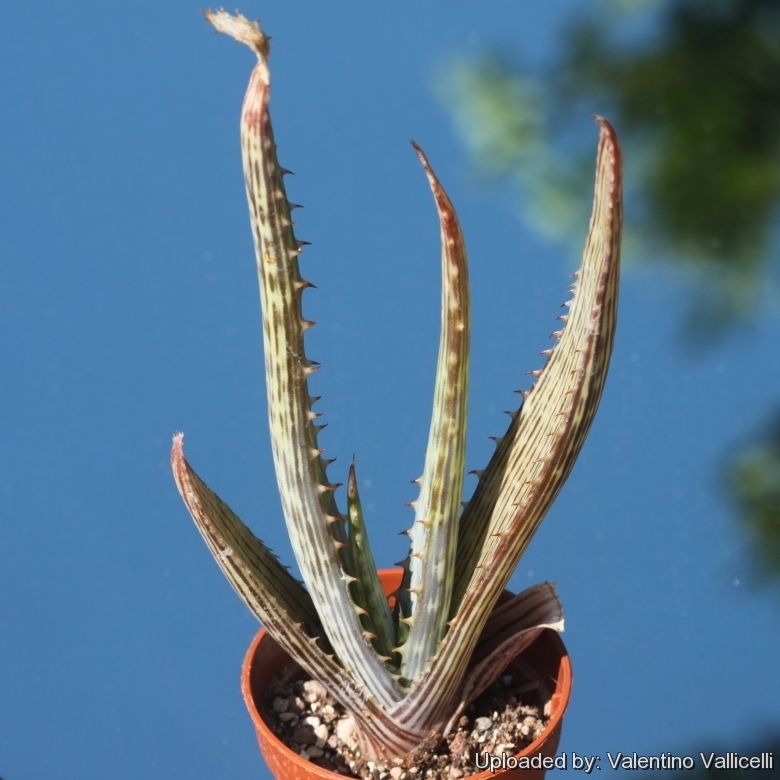 Cultivation and Propagation: Aloe pirottae is one of the most ornamental aloes that is a fast-growing species that can reach full size in 5 or 6 years (if given proper growing conditions). Like most Aloe species, this plant is a water-wise plant that may be used in xeriscaping and can grow outdoors in those areas where there is light frost in winter and the rainfall is not too high. Exposure: Outside, if the climate is cool it enjoys full sun. In warmer country, keep it cool by filtering the afternoon sun, and also avoid using a dark-coloured container. Water: Aloe pirottae is an ideal water-wise plant, especially in arid and semi-arid regions, but it comes from summer-rainfall areas, and appreciates consistent moisture during the summer months. As the plant gets established, reduce the amount of water and don't water at all during the rainy season. Established plants can take care of themselves as they store water in their leaves and are well adapted to an arid environment. Hardiness: This is a winter dormant aloe. Although from the warmer and tropical africa, this plant has proven hardy in unprotected gardens to temperatures down to 0° C (or even less). Pests and diseases: It is susceptible to snout weevil and scale infestation, and to fungal infections. If in a pot try not to over water plants, tilt the pot so water never sits in the rosette. Water sitting in the rosette is the greatest cause of rotting these plants. Uses: The plant's succulent leaves contain natural antibiotics and are said to have healing properties. Propagation: This plant is propagated from seed. To grow the seeds keep them wet at all times do not let them dry out, 10-18 days and you will have success. Keep the soil wet for young ones until they are able to transplant into a larger container. 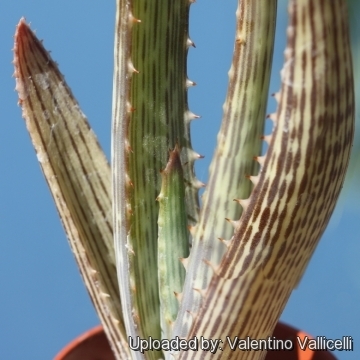 When growing this aloes from seed there is one important consideration to bear in mind, the young plants are fairly slow growing and a systemic fungicide should be added to the watering as the they are very vulnerable.Take care not to over-water the seedlings, too much water may cause them to rot.